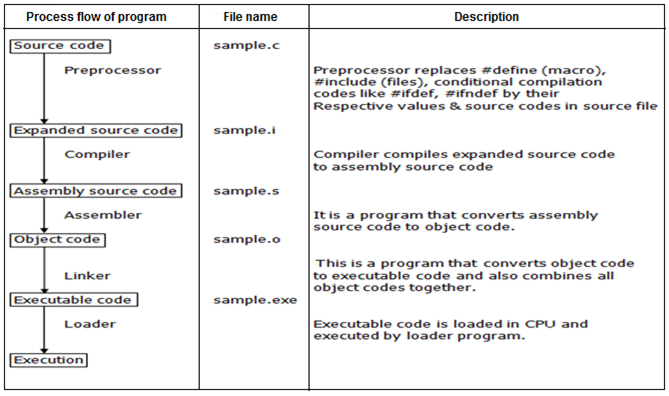 The C processor is a macro processor which is used to compile the source code of the program (step by step) . It is not a part of the compiler. All pre-processor commands begin with hash symbol (#). Macro Macro is used to define the constant value and data types. Header file inclusion The source code of the file “file_name” is included in the main program at the specified place. Conditional compilation It is used to set of commands in source program. Other directives #undef is used to defined a macro variable and #Pragma is used to call a function before and after main function. There are following important pre-processor directories in C language. #define Substitutes a pre-processor macro. #include It is used to inserts a particular header from another file. #undef It is used to undefine a preprocessor macro. #ifdef It is used to return true if this macro is defined. #ifdef It is used to return if this macro is defined. #if It is used to check compile time condition. #else The alternative for #if. #elif #if and #else in one statement. #endif It is used to end pre-processor conditional. #error It is used to print error message on stderr. #pragma Issues special command to the compiler, using a standardized method. A macro is a name which stands for a fragment of code. Before using macro we must define it with ‘#define’ directive. It is the name of macro. There are two types of macros. The object-like macro is an identifier that is replaced by value. It is widely used to represent numeric constants. Function like macros are used as function call. Let us consider an example. Here MAX is the macro name. _DATE_ It is defined as current date with “MMM DD YYY” format. _TIME_ It is defined as current time with “HH:MM:SS” format. _FILE_ It contains the current filename as a string literal. _STDC_ It is defined as 1 when compiler compiles with the ANSI standard. It defines constant value. It can be any of the basic data types. It is used to paste code of given file into current file. We can use system-defined and used-defined header files. There are two types of #include directive. It is used to check undefined the constant or macro. It is defined by #define. The ‘#ifdef’ directive is used to check whether macro is defined or not. If it is defined then, ‘if’ clause statements are included in source code. Otherwise “else” clause statements are included in source file for compilation and execution. The C #Pragma is used to call a function before and after main function. It also provides additional information to the compiler. There are several types of pragmas in GCC compiler.